William Makepeace Thackeray (July 18, 1811 – December 24, 1863) was an English novelist of the nineteenth century. He was famous for his satirical works, particularly Vanity Fair, a panoramic portrait of English society. Its heroine, Becky Sharp, is one of the stronger female characters to emerge from the nineteenth century. In Thackeray's own day, some commentators, such as Anthony Trollope ranked his The History of Henry Esmond as his greatest work, perhaps because it expressed Victorian values of duty and earnestness, as did some of his other later novels. It is perhaps for this reason that they have not survived as well as Vanity Fair, which satirizes those values. The power of satire lies in its ability to create sympathetically treat human foibles while at the same time lampooning them, as Thackeray does in Vanity Fair. Thackeray was born in Calcutta, India, where his father, Richmond Thackeray, was a high-ranking official in the British East India Company. His mother, Anne née Beacher, married Richmond Thackeray on October 13, 1810 after being sent to India in 1809. She was sent abroad after being told that the man she loved, Henry Carmichael-Smyth, had died. This was not true, but her family wanted a better marriage for her than with Carmichael-Smyth, a military man. The truth was unexpectedly revealed in 1812 when Richmond Thackeray unwittingly invited to dinner the supposedly dead Carmichael-Smyth. 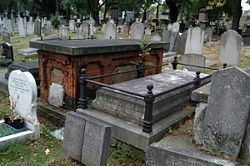 Richmond Thackeray died on September 13, 1815. Henry Carmichael-Smyth married Anne in 1818 and they returned to England shortly after. William had been sent to England earlier, at the age of five, with a short stopover at St. Helena where the prisoner Napoleon was pointed out to him. He was educated at schools in Southampton and Chiswick and then at Charterhouse School, where he was a close friend of caricaturist, John Leech. He disliked Charterhouse, parodying it in his later fiction as "Slaughterhouse." He then studied at Trinity College, Cambridge, but was never too keen on academic studies and left the University in 1830. He travelled for some time on the continent, visiting Paris and Weimar, where he met Johann Wolfgang von Goethe. He returned to England and began to study law at the Middle Temple, but soon gave that up. On reaching 21, he came into his inheritance, but he squandered much of it on gambling and by funding two unsuccessful newspapers, The National Standard and The Constitutional, which he had hoped to write for. He also lost a good part of his fortune in the collapse of two Indian banks. Forced to consider a profession to support himself, he turned first to art, which he studied in Paris, but he did not pursue it, except in later years as the illustrator of some of his own novels and other writings. Thackeray's years of semi-idleness ended after he met and, in 1836, married Isabella Shawe, who bore him three daughters, two of whom survived. He now began "writing for his life," as he put it, turning to journalism in an effort to support his young family. He primarily worked for Fraser's Magazine, a sharp-witted and sharp-tongued conservative publication, for which he produced art criticism, short fictional sketches, and two longer fictional works, Catherine and The Luck of Barry Lyndon. Later, through his connection to the illustrator John Leech, he began writing for the newly created Punch magazine, where he published The Snob Papers, later collected as The Book of Snobs. This work popularized the modern meaning of the word "snob." Meanwhile tragedy struck in his personal life as his wife succumbed to depression after the birth of their third child. She attempted suicide and eventually lapsed into a permanent state of a detachment from reality. Thackeray desperately sought cures for her, but nothing worked, and she ended up confined in a home, where she remained until 1893, outliving her husband by 30 years. After his wife's illness, Thackeray became a virtual bachelor, pursuing other women such as Mrs. Jane Brookfield, but never establishing another permanent relationship. 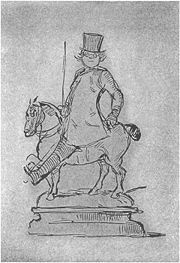 In the early 1840s, Thackeray had some success with two travel books, The Paris Sketch Book and The Irish Sketch Book. Later in the decade, he achieved some notoriety with his Snob Papers, but the work that really established his fame was the novel Vanity Fair, which first appeared in serialized installments beginning in January 1847. Even before Vanity Fair completed its serial run, Thackeray had become a celebrity, sought after by the very lords and ladies he satirized and hailed as the equal of Dickens. He remained "at the top of the tree," as he put it, for the remaining decade and a half of his life, producing several large novels, notably Pendennis, The Newcomes, and The History of Henry Esmond, despite various illnesses, including a near fatal one that struck him in 1849 in the middle of writing Pendennis. He twice visited the United States on lecture tours during this period, and there fell in love with the young American girl, Sally Baxter. Thackeray also gave lectures in London, on the English humorists of the eighteenth century, and on the first four Hanoverian monarchs, the latter series being published in book form as The Four Georges. He also stood unsuccessfully as an independent for Parliament. 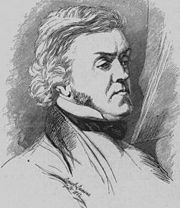 Ill for much of his later years and feeling he had lost much of his creative impetus, Thackeray died of a stroke in 1863. His funeral was attended by as many as 7,000 people. He was buried in Kensal Green Cemetery, and a memorial bust sculpted by Marochetti can be found in Westminster Abbey. Thackeray began as a satirist and parodist, with a sneaking fondness for roguish upstarts like Becky Sharp in Vanity Fair, Barry Lyndon in The Luck of Barry Lyndon, and the eponymous title character from Catherine. In his earliest works, writing under such pseudonyms as Charles James Yellowplush, Michael Angelo Titmarsh, and George Savage Fitz-Boodle, he tended towards the savage in his attacks on high society, military prowess, the institution of marriage, and hypocrisy. One of his very earliest works was "Timbuctoo," a satirical poem written for a Cambridge poetry contest won by Alfred Lord Tennyson in 1829, but his writing career really began with a series of satirical sketches usually known now as The Yellowplush Papers, which appeared in Fraser's Magazine beginning in 1837. Between May 1839 and February 1840, Fraser's published the work sometimes considered Thackeray's first novel, Catherine, originally intended as a satire of the Newgate school of crime fiction, but ending up more as a rollicking picaresque tale in its own right. 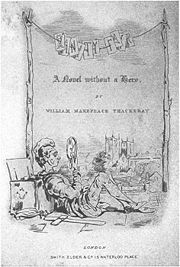 In The Luck of Barry Lyndon, a novel serialized in Fraser's in 1844, Thackeray explored the situation of an outsider trying to achieve status in high society, a theme he developed much more successfully in Vanity Fair in the character of Becky Sharp, the artist's daughter who rises nearly to the heights by manipulating the other characters. He is best known now for Vanity Fair, with its deft skewerings of human foibles and its roguishly attractive heroine. His large novels from the period after Vanity Fair, once described unflatteringly by Henry James as examples of "loose baggy monsters," have faded from view, perhaps because they reflect a mellowing in the author, who became so successful with his satires on society that he seemed to lose his zest for attacking it. The later works include Pendennis, a type of bildungsroman depicting the coming of age of Arthur Pendennis, an alter ego of Thackeray's who also features as the narrator of two later novels: The Newcomes and The Adventures of Philip. The Newcomes is noteworthy for its critical portrayal of the "marriage market," while Philip is noteworthy for its semi-autobiographical look back at Thackeray's early life, in which the author partially regains some of his early satirical zest. Also notable among the later novels is The History of Henry Esmond, in which Thackeray attempted to write a novel in the style of the eighteenth century. In fact, the eighteenth century held a great appeal for Thackeray. Besides Esmond, Barry Lyndon and Catherine are set during that period, as is the sequel to Esmond, The Virginians, which takes place in America and includes George Washington as a character who nearly kills one of the protagonists in a duel. Thackeray is most often compared to one other great novelist of Victorian literature, Charles Dickens. During the Victorian era, he was ranked second only to Dickens, but he is now much less read and is known almost exclusively as the author of Vanity Fair. In that novel he was able to satirize whole swaths of humanity while retaining a light touch. It also features his most memorable character, the engagingly roguish Becky Sharp. As a result, unlike Thackeray's other novels, it remains popular with the general reading public, is a standard fixture in university courses, and has been repeatedly adapted for movies and television. In Thackeray's own day, some commentators, such as Anthony Trollope ranked his The History of Henry Esmond as his greatest work, perhaps because it expressed Victorian values of duty and earnestness, as did some of his other later novels. It is perhaps for this reason that they have not survived as well as Vanity Fair, which satirizes those values. Thackeray saw himself as writing in the realist tradition and distinguished himself from the exaggerations and sentimentality of Dickens. Some later commentators have accepted this self-evaluation and seen him as a realist, but others note his inclination to use eighteenth-century narrative techniques, such as long digressions and directly addressing the reader, and argue that through them he frequently disrupts the illusion of reality. The school of Henry James, with its emphasis on maintaining that illusion, marked a break with Thackeray's techniques. One of Thackeray's daughters (Harriet, also known as Minnie) was the first wife of Sir Leslie Stephen, founding editor of the Dictionary of National Biography. With his second wife, Stephen was the father of Virginia Woolf, making Thackeray "almost" her grandfather. Thackeray's other daughter, Anne, remained close to the Stephen family after her sister's death; young Virginia referred to her as Aunt Anny and created a character based on her in her novel Night and Day. Al Murray ("the Pub Landlord") is a direct descendant. Thackeray provided such a positive review of Jane Eyre that Charlotte Bronte dedicated the second edition to him. This caused her some great embarrassment when she found out about the parallels between the book's plot and Thackeray's domestic situation. 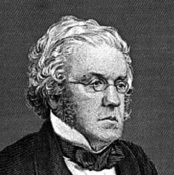 History of "William Makepeace Thackeray"
This page was last modified on 21 October 2016, at 15:32.